King Anawrahta built Shwesandaw Pagoda after his conquest of Thaton in 1057. 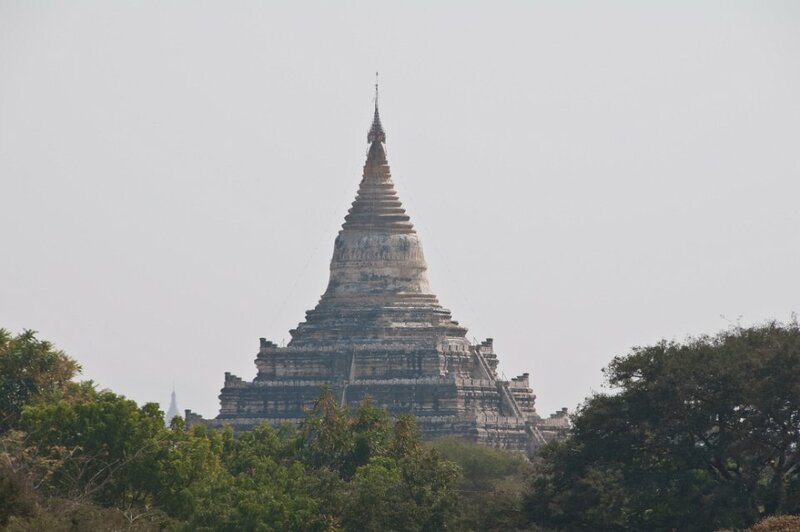 This graceful circular pagoda was constructed at the centre of his newly empowered kingdom. The pagoda was also known as Ganesh or Mahapeine after the elephant-headed Hindu god whose images once stood at the corners of the five successive terraces. The five terraces once bore terracotta plaques showing scenes from the jalakas, but traces of these, and of other sculptures, were covered by lather heavy-handed renovations. King Anawrahta built Shwesandaw Pagoda after his conquest of Thaton in 1057. This graceful circular pagoda was constructed at the centre of his newly empowered kingdom. The pagoda was also known as Ganesh or Mahapeine after the elephant-headed Hindu god whose images once stood at the corners of the five successive terraces. The five terraces once bore terracotta plaques showing scenes from the jalakas, but traces of these, and of other sculptures, were covered by lather heavy-handed renovations.